If you're looking for local raw honey be sure to call on Flying Dutchman for your needs. Our honey comes from the mountains and valleys of beautiful Vancouver Island. We sell local liquid honey, creamed honey and honey comb (seasonal) at our shop in Nanaimo. You can check us out at the Qualicum Beach Farmers Market, Qualicum Beach Seedy Saturday. the Coombs Fall Fair, Lighthouse Country Fall Fair and Winterfest Christmas Craft Fair. 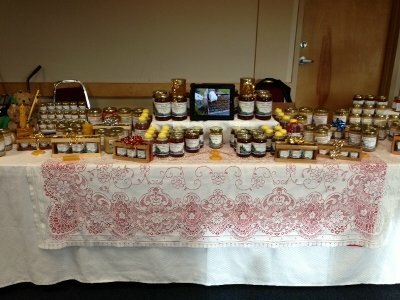 We have participated in the Winterfest Christmas Craft Fair in Parksville for the past couple of years displaying our honey products and gift packages. People are always looking for something unique to give to their family and friends for the up and coming holiday.